Visual floaters are blobs, thread-like strands, fine cobwebs, or just dull shadows and spots in your vision. They are more noticeable when you look at a white wall or plain, light-coloured surface such as the sky. Floaters are actually particles within the vitreous fluid, the clear gel-like substance that fills the inside of your eyeball. These particles cast shadows on the retina, the light-sensitive layer at the back of your eye. As you get older, floaters become more common. Floaters are relatively common and usually harmless. When are floaters more serious? Floaters can be a sign of something more serious. This is when the gel-like vitreous fluid, which is normally attached to the retina at the back of your eye, separates from the retina. Most people with posterior vitreous detachment simply have floaters, which can be a nuisance but usually settle over a few months. However, occasionally it can happen with, or lead to, a retinal detachment. Retinal detachment is painless, but it is a medical emergency as it can cause blindness unless treated immediately. For this reason, posterior vitreous detachment always needs to be assessed, to make sure it isn't causing, or happening with, retinal detachment. If you have new floaters or flashes, it's best to get your eyes checked immediately (today) to look for any sign of retinal detachment. This is when a tiny blood vessel in the retina bursts and leaks blood into the gel-like vitreous, causing the sudden appearance of floaters. Sometimes this just causes small floaters that don't need treatment. 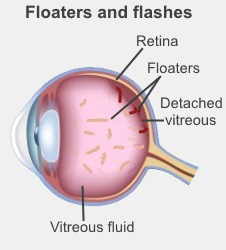 Other times, the floaters may be large enough to affect your vision, and you will need surgery. It can also be a sign of eye damage caused by diabetes. Get your eyes checked to find out what has caused this.